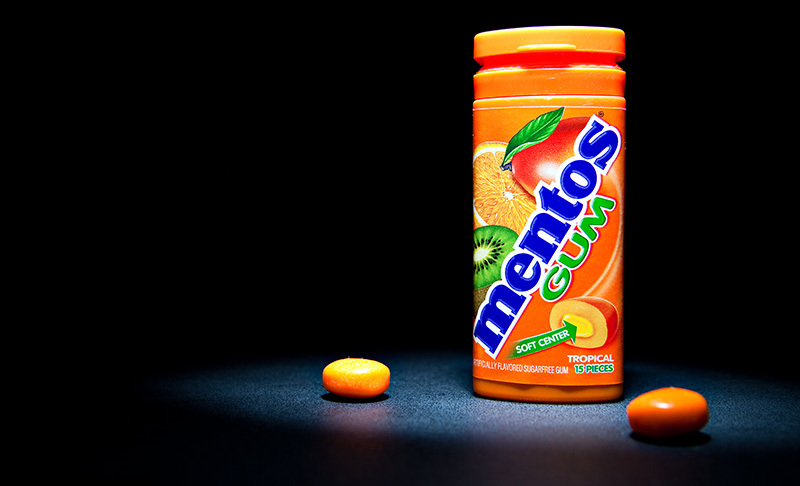 Today is another product shot, this time Mentos gum. 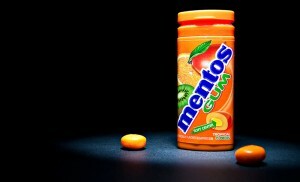 I wouldn’t normally buy Mentos gum, especially tropical flavor but they were giving it away at the store so figured since it was free why not get it and use it for a daily photo. I shot this also with a white background but I like the dramatic effect of the bright orange with the black background. For this shot the background is a 43″ 5-1 circular reflector and the foreground is the back of one of my speakers. I used a Canon 580EXII with a white paper snoot on 1/32 power and directed the light mostly straight down with a slight tilt toward the Mentos. This allowed the front to be lit up nicely. This was shot with a Canon 5DII at 1/125th second @f/8.